This area once referred to as the Haut-Graves was given its own appellation Pessac-Léognan in 1987. This southern area in the outskirts of Bordeaux around Pessac marks the area that really first established Bordeaux’s reputation as an exporter and producer of the very finest wines. Despite this the region in the post 1945 period had become less well known than both the Haut-Médoc, St Emilion and Pomerol and, despite the obvious stars of the appellation Haut-Brion and La Mission Haut-Brion, many chateaux in the region weren’t performing at their best. The past decade has seen a lot of change however, and hefty investment and new ownership in Pessac-Léognan has brought a number of the wines back into the top rank. Prices too have gone up too and some are on par with the likes of the top ‘super seconds’ in Pauillac and St Julien. Overall there is an earthy aspect to the red wines of this area and they have warmth you don’t always find up in the northern Médoc and a richness to go alongside the mineral/gravel undertones. The whites, in varying blends of Sauvignon Blanc and Semillon, don’t have the exuberance you find in New Zealand or have the fresh grassy quality you find in the Loire but the best are more structured whites, usually that have had a degree of barrel influence, and, although they can be delicious young they tend to be best with a bit of age when the finest take on a waxy quality but still retain freshness and acid. In youth they cry out for fruits de mer, in maturity they call for lobster. It is also worth remembering because of the gravelly soils of the region, which often allow for excellent drainage, Pessac-Léognan can be very successful in wet vintages. This is certainly true in 2007 for a number of wines from the appellation. The reverse is also true and in hot and dry years the vines here, a bit like in Margaux, can quite stressed. Amongst the individual chateaux themselves there is no doubt that Château Haut-Brion and neighbour Château La Mission Haut-Brion, under the same ownership American ownership since 1983, lead the appellation of Pessac-Léognan. 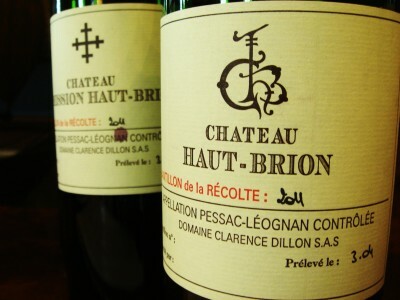 There are many who believe that Haut-Brion is the very finest of all the first growths classified in 1855. It remains the least speculated of the bunch, though it is on par with the price of Château Mouton-Rothschild and Château Margaux in most vintages now, with Lafite and Latour way ahead leading the pack. The white wine here is an extraordinarily concentrated and fabulously expensive number. La Mission is pretty much Haut Brion’s equal tending to me to be spicier and obviously tannic. The whites here, Chateau Haut-Brion Blanc and Chateau La Mission Haut-Brion Blanc are fabulous [and fabulously expensive] and about as good as serious white wines gets. Clarté de Haut Brion, made from grapes not quite up to scratch for these, is usually seriously good and comparatively more affordable. Château Pape Clément is a mile or so up the road from Haut-Brion and has been on top form for the past twenty years or so. Since its acquisition by Bernard Magrez it now makes some of the appellations most concentrated and delicious wines. The 2009 and 2010 Pape Clément is outstanding. Brilliant wine has also been made here in 2012. The whites here are full of flavour and pretty exotic. Château Haut-Bailly and Domaine de Chevalier are also two excellent estates with fine reputations, similarly in the ascendant. Haut Bailly makes fine, stylish red and Domaine de Chevalier is well known for the extremely fine quality of its white wine, which is pretty linear in style but ages superbly. The red wines here are recently also very good. Château Smith Haut Lafitte is another property that has undergone a renaissance in the past decade or so. It, too, now makes wonderful whites and reds. Château de Fieuzal is also property to get excited about, especially if someone approaches you with a perspiring chilled bottle of its white. The red is increasingly good too. Other wines that look good from my recent tastings here are Château Bouscaut, especially the white that is full of flavour and nicely priced. Their red is pretty nifty too. Do also check out Château Carbonnieux, its white is lean but puts on weight in the bottle and the red has good complexity. Château La Louvière makes excellent value red and white and is usually a pretty sure bet in most vintages. Château Latour-Martillac is solid and reliable and Château Malartic-Lagravière has emerged as a rising star in both red and white. Château Olivier is classical [as one of the oldest wine producing estates in Bordeaux this is appropriate]. I’ve found that Château Pique Caillou also produces reliable reds and whites at competitive prices. For more detailed notes on the individual properties, please click on the individual chateaux profiles under this heading.